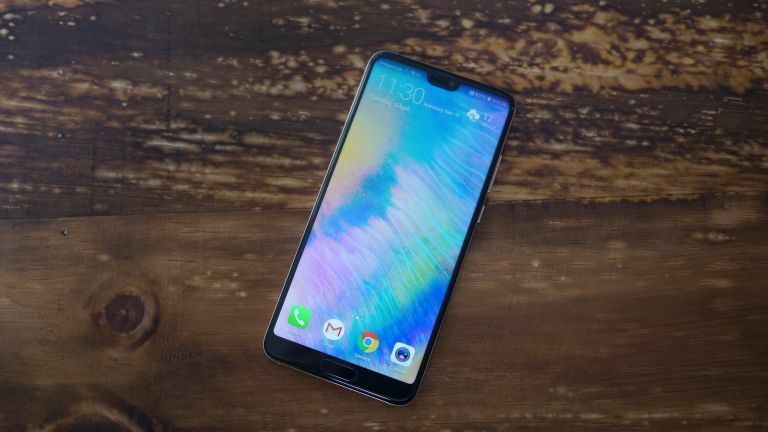 Alongside the rather brilliant P20 Pro, Huawei released a slightly smaller model, the standard P20. Even though the P20 Pro is more innovative (with its impressive triple camera system), the P20 is still an important phone, and costs considerably less than the Pro. If you're after a properly premium Android smartphone, a Google-powered iPhone X, then this could be the handset for you. The P20 is a big departure from Huawei's last smartphone, the P10, both in terms of design and software. That's why the Chinese brand called it the P20 and not the P11 – a one number jump isn't significant enough. In terms of design, there's no getting away from it – the Huawei P20 looks a lot like the iPhone X. It's not just the notch at the top of the 5.8-inch display, it's also the rounded edges and glass back. That's not necessarily a bad thing – it's a beautiful phone – but some people will take one look at it and instantly dismiss it as an iPhone wannabe. I think this design also make it much more comfortable to hold than the Samsung Galaxy S9, perhaps Huawei's biggest rival. The P20 is the slightly smaller flagship device in Huawei's latest lineup - sitting under the larger Huawei P20 Pro which has a 6.1-inch display. I think it's the perfect size, and it feels incredibly well made. Huawei has introduced gradient colourways, which change colour depending on how the light hits it. These new colours are called "Twilight" (black and petrol blue) and Pink Gold (pink and gold, obviously). I think they're great, and am really fond of the Pink Gold of our review unit. The main highlight of the P20 Pro is the innovative triple camera system, unfortunately, the standard P20 only features a dual lens setup. This is the similar Leica branded setup found in the Mate 10, with a 12MP colour sensor and 20MP monochrome sensor. Huawei has increased the pixel size, and included new artificial intelligence image stabilisation, but we think you'll still feel like you're missing out not having the telephoto lens and 40MP resolution. The camera is still capable of taking some very good images, but it's just not as flexible or capable as the P20 Pro. Inside there’s an octa-core Kirin 970 chipset and 4GB RAM with 128GB of storage. It's lightning fast, and will likely remain that way for a long time. The battery is an impressive 3,400mAh, and can last around one and a half days. That's great considering the P20 measures around 7.5mm. The P20 is a beautiful smartphone, especially in its new 'gradient' colourways. The device is well made, and the software is improving over previous generations. I think the 5.8-inch screen is the perfect size, as well. It's unfortunate that the inevitable iPhone X comparisons will be drawn, and that this smaller 5.8-inch device doesn't feature the Pro's triple camera system. Otherwise it might have been the perfect Android device.